Lauren Grunebaum is a psychotherapist with a private practice in Manhattan. She treats children, adults, couples, and families with a range of emotional difficulties. These include: depression, anxiety, marital issues, parent-child conflicts, career difficulties, and coping with chronic illness. Her passion and expertise is in treating individuals and families with eating disorders. Lauren earned her undergraduate degree from Smith College and her Master's degree in Clinical Social Work from Columbia University. She went on to earn a two year post-Master's certificate in child, adolescent, and family therapy from the Smith School of Social Work. She has also taken classes at the Ackerman Institute for the Family. Lauren was part of a National Institute of Health grant in maternal and child health where she treated children and families with chronic illness and did community outreach. She was also on the faculty of the Mount Sinai Medical School where she taught a tutorial on the impact of chronic illness on the family. Lauren completed training in the Maudsley Method (Family Based Treatment) for eating disorders. 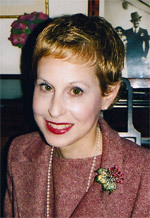 It is as a result of her own battle with anorexia nervosa and her struggle to find appropriate treatment that she created the programs "Starving at the Banquet," in the fall of 2009 and a short term adolescent group program, "Starving at the Banquet, Finding the Voice Within," in the fall of 2010. Lauren writes a blog on eating disorders for psychologytoday.com. It is called "Starving at the Banquet, Eating Disorders from both Sides of the Couch." She also cocreated "Litapayach Tikvah, To Nourish Hope," a program on eating disorders for the Union for Reform Judaism.